Change is in the air, my friends. The days are getting shorter. The air is getting crisper. The trees are exploding with vibrant colors. The grocery store aisles are filing up with candy corn, pumpkin-flavored everything, and various other seasonal delights. It’s my favorite season of all. But as soon as it arrives, it’s gone again – replaced by the slow, steady march toward Winter. Any day now, we’ll be nestled away in our houses for the long cold months…but not today. There’s still time to squeeze in some outdoor activity. Instead of early hibernation, take advantage of this gorgeous season, absorb every last drop of Vitamin D and get your calorie burn on. I’ve put together a 5-move workout that’ll get you the most bang for your core training buck during these fleeting days of Fall. 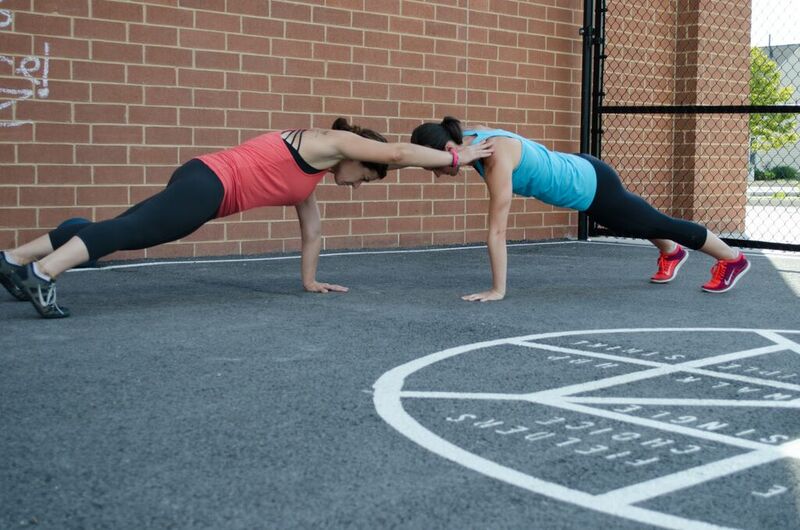 Round up a buddy, grab a ball and let’s get those abs in shape before the last leaf drops. Side Toss: Stand facing in opposite directions so your left shoulder is about 4-6 feet away from your partner’s right shoulder. Place the ball at your right hip. Use your core to twist the ball toward your partner. Release the ball at chest level and pass directly in front of your partner. Alternate as quickly as you can while maintaining control for 30-45 seconds. Shoulder Tap Planks: Assume a good high plank position with your hands under your shoulders and your feet as wide as your hands. You and your partner should be set up so that the crown of your heads are about 6-8 inches apart and facing each other. Without shifting or rotating at your hips, both partners lift their right hands and tap each other on the shoulder. Alternate as quickly as you can while maintaining control for 30-45 seconds. Sit Up Toss: Sit facing your partner with your feet firmly planted on the ground about 3 feet from your partner’s feet. Reach the ball over your head and roll back in a controlled manner until your back is on the ground. Then exhale as you roll up (using the ball to help build momentum) and release the ball so that your partner can catch it at chest level before rolling back to repeat the same movement pattern. Alternate as quickly as you can while maintaining control for 30-45 seconds. 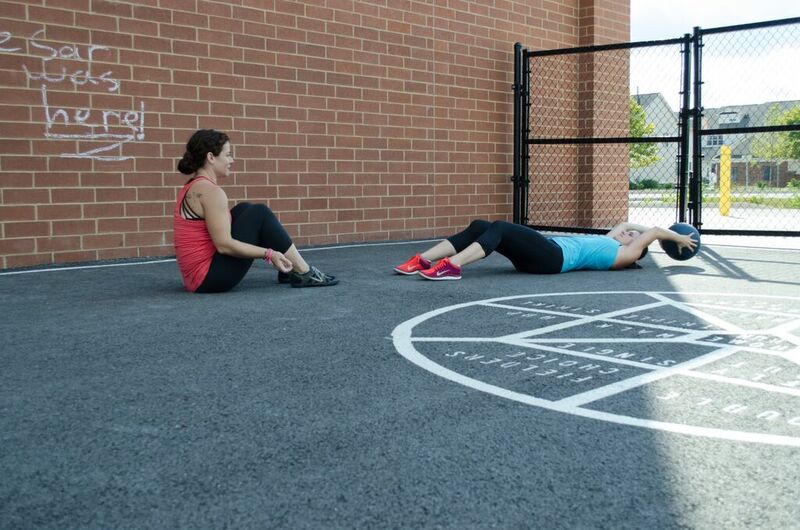 Anchored Leg Pushes: Lie on the ground with your head at your partner’s feet, partner’s feet facing forward. 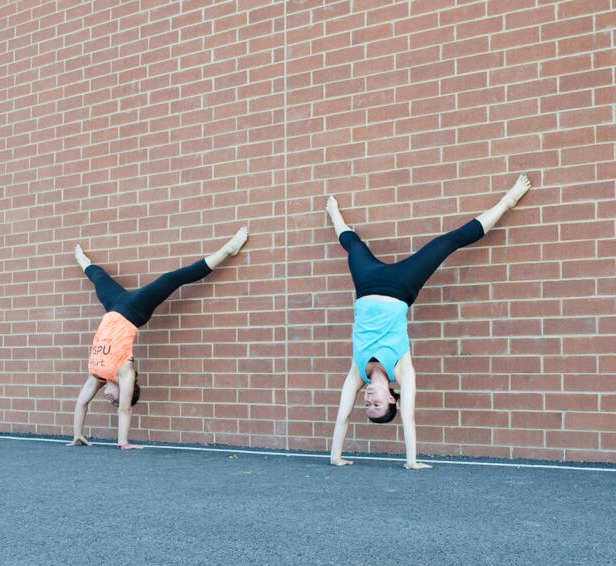 Grab your partner’s ankles, press your low back into the ground and raise your legs up toward your partner. As your partner pushes your feet away and back toward the ground, keep pressing your abs tight and your legs as straight as possible; control the momentum of your legs. Lift your feet back up toward your partner for the next rep. Move as quickly as you can while maintaining control for 30-45 seconds then switch with your partner. Tuck Jump Leap-Frog: Stand to one side of a partner who is lying on the ground face down. Squat low with your arms by your hips. In one fast movement, throw our arms up over your head as you jump into the air up and over to the other side of your partner. 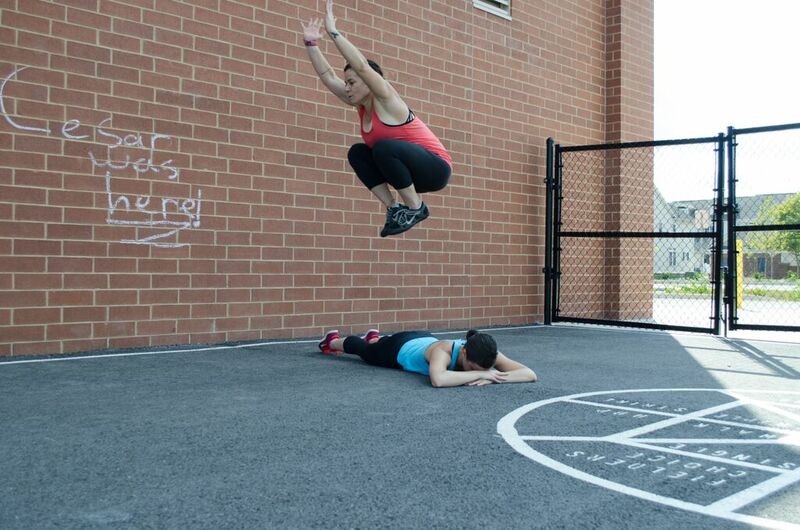 As you jump pull your knees up as high as you can toward your chest. Complete 4-6 jumps then switch with your partner. NOTE – it’s a good idea to practice this one without your buddy first to be sure that you can safely make the leap. Or stand above your partner’s head with your feet even with their shoulder. Jump to the side so you are level with the other shoulder. And when the transition to Winter is complete, take recess inside as you tap into more than 100 hours of fitness programming with AcaciaTV. With programs like Body Defining Calorie Blast with Deazie Gibson and Calorie Burn Bootcamp with Amanda Young you’ll be warm, toasty and fit all winter long no matter what’s happening outside your window. Not a member yet? Start your 10 Day Trial now. Share your favorite buddy workouts. Post it on Twitter, Facebook or Instagram with the hashtag #AcaciaTV.